Lebanese Force leader Samir Geagea slammed on Thursday Hizbullah chief Sayyed Hassan Nasrallah over his latest speech, describing his party's dialogue with the Free Patriotic Movement as Fruitful. “Lebanon has no interest in verbally assaulting Saudi Arabia or the Arab coalition,” Samir Geagea said at a press conference held in Maarab. The LF leader called on politicians to prioritize Lebanon's interests in order to safeguard it from the developments in the region. Geagea drew a comparison between the Shiite Huthi rebels who occupied the Yemeni capital Sanaa and the popular revolt in Syria, stressing that the rebels initiated the attacks. The Hizbullah chief unleashed a tirade against Saudi Arabia after the offensive over its intervention in Yemen, calling it "surprising and painful," and suggesting Riyadh would suffer a "humiliating defeat" if it didn't resolve the conflict through negotiations. A Saudi-led coalition began bombing Yemen last week, saying it was targeting the Shiite Huthi rebels and their allies. The March 14 alliance backed the Saudi campaign. Samir Geagea accused Hizbullah of breaching the law by intervening in field battles in the neighboring country Syria. The presidential candidate lashed out at parliamentary blocs that are boycotting the elections. MPs failed on several occasions, the latest on Thursday, to elect a new head of state over lack of quorum. President Michel Suleiman's term ended in May without the election of a successor. Hizbullah and Aoun's Change and Reform bloc have been boycotting electoral sessions due to a disagreement with the March 14 camp over a compromise presidential candidate. 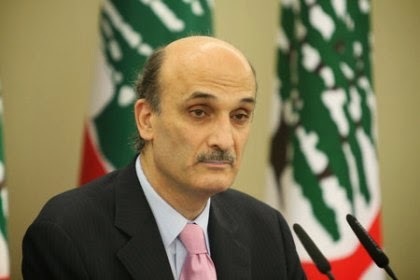 Concerning the dialogue between the LF and the FPM, Geagea stressed that “it's tackling all disputes,” citing progress. “We have failed to reach common grounds with the FPM over the presidential election,” Samir Geagea said, denying comments over him accepting the nomination of Aoun to the Baabda Palace. The talks between the FPM and the LF are expected to be crowned with a meeting between the old-time rivals.